Berlin is the capital of the re-unified Germany. The former West Berlin finished with its trams in the 1960s, but the former East continued to use them, and it is in this area where they flourish today. The system almost has two networks, a smaller one in the historic town of Köpenick, the other in central Berlin with services running through and terminating at Alexanderplatz. The current fleet consists of modernised Tatra KT4Ds, ADtrans/Bombardier GT6N and GT6N-ZRs and modern low floor Bombardier Flexity Berlin F6E, F6Z, F8Z and F8E trams. 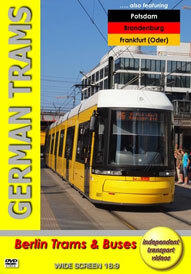 The fleet is operated by BVG (Berliner Verkehrsbetriebe) and is smartly turned out in a yellow livery with white roofs. The modern bus fleet is in the same livery and is also featured on this programme. Our filming commences at the busy Alexanderplatz where we see all types of trams in service. We then move to Köpenick and film along Bahnhofstraße and Lindenstraße before arriving at Alt-Köpenick, the pretty historic part of the town. With filming complete we board tram 1078 on route 62 back to Bahnhofstraße. Our next journey is to Landsberger Allee on board tram 1090 operating route 27. Here we transfer to route M6, riding on a Tatra KT4D, cars 6085+6171, for our journey to Hackescher Markt in central Berlin. We turn our attention to buses now as we film outside of the Hauptbahnhof, along Alt-Moabit and Spreeweg. A busy area for buses is Potsdamer Platz where we see a number of sightseeing buses as well at the impressive three axle MAN ND313 ‘Lion’s City’ double deckers. We then take a ride on one such vehicle, 3121 (B-V 3121), to the busy Zoo Garten bus station. Further rides are taken on these impressive buses on our return to the central area. To reflect the vibrancy of this city we do some night time filming around the Alexanderplatz area of both the trams and the buses. Our next city visit is a brief one to Potsdam. A historic city to the south west of Berlin, which is linked by the S-Bahn train. The current tram fleet is made up of refurbished Tatra KT4DM and KT4DC trams, Siemens Combino and Stadler Variobahn trams all of which are immaculately turned out in a modern white and dark green livery and are operated by ViP (Verkehrsbetrieb Potsdam GmbH). This standard gauge system was electrified in 1907. Our filming takes place along Zeppelinstraße and Friedrich-Ebert-Straße, the latter outside the historic city gateway. Our next visit is to the town of Brandenburg. Built on the river Havel to the west of Berlin this small town is starting to improve its looks with restoration of the original architecture taking place. The current fleet is operated by VBBr (Verkehrsbetriebe Brandenburg an der Havel GmbH) and consists of Tatra KTNF6 (low-floor section), Tatra KT4D and four Siemens/Duewag MGT6D cars. Filming takes place at Neustadtischer Markt, the Hauptbahnhof and Steinstraße. Our cameras also take a ride on Tatra KT4D, number 179 on route 6 to the Hauptbahnhof. Our final visit is to the small town of Frankfurt (Oder), situated to the east of Berlin on the Polish border. The current fleet has Tatra KT4Ds and eight former Nürenburg AEG/ADtranz GT6M cars. SVF (Stadtverkehrsgesellschaft mbH) is the operating company and the livery of the fleet is all over pale green, which is also carried by the buses. Our filming on this programme concludes on Heilbronner Straße. Duration : 84 minutes (approx).